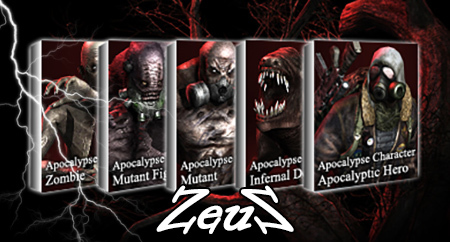 Apocalypse Characters BUNDLE - Apocalyptic Hero, Mutant Fighter, Infernal Dog, Mutant, Zombie. Description: This Bundle contains the following packs: Apocalyptic Hero, Mutant Fighter, Infernal Dog, Mutant, Zombie. Each Creature use high quality texture maps and a very small polygon count providing excellent visual quality for close-up shots. The Prop version of the Creature provides additional functionalities such as the capability to use the multi-duplicate iClone feature and the capability to apply key frames to the scaling of bones which may be required by some of the provided custom animations. Thank you very much Zeus! !